Thank you for visiting my site and your comments. Can you please let me know which Kolam you are referring to so that I will explain step by step. 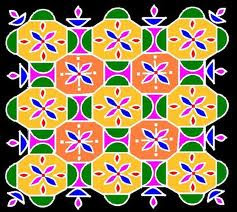 The above Kolam is 19 - 19 parallel dots (Neer Pulli) Kolam.